EIN has, on our site, regularly commended BMG for its great effort over many years in tracking down "lost" sales and we have also acknowledged that a lack of computerised (or other) records by RCA from the 1950s to 1970s has seriously undermined this effort. However, EIN has also been critical of the 1 billion sales claim, considering it to be, in the absence of accredited data, more rhetoric than substance. Recently a posting by Christopher Tyler on the Elvis Number One's Bulletin Board claimed Ernst Jorgensen had made statements regarding Elvis’ sales in a “private” letter (see posting following Ernst's interview). With the issue being close to EIN’s heart we contacted Ernst for his comments. In the following interview, he addresses the claimed “private” letter, Elvis vs. The Beatles and how BMG is trying to appeal to particular market segments thru its “genre” releases. EIN: Do you have any comment on the Chris Lee's posting on the Elvisnumberones messageboard that you wrote this letter? EJ: I don’t know how many thousands of letters regarding Elvis that I have sent over the years. There’s quite a lot that I think I can recognize, and others I’m surprised to read. I don’t like the idea of a “private letter”, if that’s what it is, is being published. I think that’s unethical, and possibly illegal. EIN: Several people have claimed that the 1 billion sales figure for Elvis (and The Beatles) is based on each sale of an album being multiplied by the number of its tracks. Obviously, using this argument makes it much easier to justify a 1 billion claim. What can you tell us about this in the context of BMG's claim that Elvis has sold more than 1 billion records & CDs? EIN: The figure of 1 billion has been around for a long time now. What is BMG's official position in 2006 on how many records & CDs Elvis has sold worldwide? EJ: I don’t know if BMG wants to have an official position on this, but I believe that 1 billion is quite likely. EIN: What percentage of these sales relate to North America ? EJ: On a normal release (“30 Number 1 Hits” as an example), total sales are 1/3 from the U.S. and 2/3 from the rest of the world. EIN: Official RIAA accreditations in the US put Elvis' sales well behind the 600 million or so units claimed for North America . A huge jump in accredited figures will be needed to bridge the 400 million sales difference. Do you think that this is likely to happen or will we continue to see incremental gains in Elvis' overall accredited sales position? About 400 U.S. album releases (RCA, Special products and more) all between one of other level of certification. RIAA only counts full millions. So if any album sold 1.999,999, it still counts as 1 million – you can try and multiply 400 by whatever average you think is mathematically realistic. EIN: What is your view on once and for all "proving" the 1 billion sales claim? EIN: Since BMG bought RCA we assume there are much more detailed sales figures, at least from the late 1980s to today. Are you able to tell us how many units Elvis has sold globally since BMG acquired RCA? EJ: “We don’t make those type of comments”, these are basically “company private”. However we are always happy to report new RIAA awards. EIN: Apart from the USA , what is the next biggest Elvis sales market (country)? EIN: What about Japan ? How do sales there compare to those in England ? EJ : I have no idea, if we are speaking about historical sales. It would be an interesting analysis. EIN: And how popular is Elvis in South America ? EJ: Elvis has been very popular in South American countries. Historically however, his sales are certainly less than in Europe. It is one of Elvis' great qualilities how he appeals to people in all countries. EIN: Are there any countries where sales have been disappointing and fan clubs need to more actively promote Elvis product? EJ: I don’t think you can look at it that way. There are historical reasons for different sales in different countries. A factor in the U.S. is that it does not have the fan club structure that many other countries have. 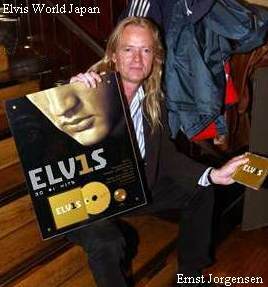 EIN: Global sales: Elvis vs. The Beatles. What is your view on the relative sales achievement of the two artists? EJ : I don’t know much about Beatles sales, but I assume that they could have some of the same problems we have in documenting sales. EIN: Ernst, It appears Elvis' sales come from numerous "smaller" sales of individual releases compared to The Beatles. Does this mean The Beatles have more record buying fans? EJ: Great question. In the U.S. records/tapes/CD’s of a song like LOVE ME TENDER (counting all releases) can be documented at about 40 million – that’s only documented sales, not counting any element of speculation. EIN: BMG and recycled/repackaged Elvis product. Some people (including EIN) are critical that BMG treats the Elvis catalog as a commodity rather than an artistic body of work. Is it fair to say that, as happened by the early 1990s, sales of recycled Elvis product are generally declining? EJ: Over 12 million sold of “Elvis 30 Number 1 Hits”! If you talk about sales of original albums, they were never the best selling records. EIN: Elvis was a major seller of albums in the 1950s –early 1960s but his album appeal declined due to the string of soundtrack albums, some good, some poor. Even though things improved from the late 1960s, Elvis was never a seller of albums on the scale of The Beatles, The Eagles, Garth Brooks or Michael Jackson (at his peak). Doesn’t this suggest there are more record buying fans of these artists than Elvis? EJ: Firstly, see my comment about LOVE ME TENDER. Secondly, the sales potential of music definitely has obviously escalated in recent decades. Elvis’ first album became RCA’s all-time bestseller in 1956 by selling 300, 000 copies. We have had an album selling 10-12 million from from just a few years ago to now. Elvis easily sold 1-2 million copies of his singles back then, and today you hardly sell any. It is a different world, and it becomes fairly meaningless to compare achievements only by sales figures. EIN: The last “official” figure we saw had global sales of 30 #1’s around 10 million. So it is now globally 12 million? EJ: I haven’t checked the number recently. EIN: Ernst, wouldn't it serve Elvis' legacy better if BMG started strategically marketing "genres" of his vast catalog (eg, soul and blues) to those particular market segments? This would build up Elvis' credibility as a serious recording artist and not just a recyclable pop artist. EJ: That is what we are doing with the 3 new February "genre" releases, Rock , Country and Inspirational (Gospel). EIN: Critics will say the “genre” albums are just more of the same old recycled product. There have been many Elvis other rock, inspirational and country albums released over the years. Why not promote Elvis’ little known and under appreciated “soul” catalog and open up his appeal to a new market which will grow his legacy rather than just appealing to the same record buying demographic? EJ: I’m not sure what you mean. We try and market as much of the catalog as possible, but there are recordings that have more sales appeal than others. EIN: Do we really need a plethora of greatest hits collections, eg. Elvis 30 #1 Hits, Elvis Golden Records Vols 1-5, Presley All-Time Greatest Hits, rather than just concentrating on one or two important releases as happens with artists such as The Beatles? EJ: Yes we do. That’s how the record business works. We are not deleting titles that our retailers want. EIN: Yet, for the greatest hits of The Beatles you really only have the Red & Blue albums and The Beatles 1. There is a similar situation with other major artists like Jimi Hendrix, Marc Bolan and The Doors. EJ: I have certainly seen a lot of Doors compilations, but the point is that Elvis music was developed in the “singles” area, where the others launched their careers when albums had become the main product. We can’t change the past. EIN: It has been suggested that BMG’s current policy actually “hurts” Elvis’ credibility with the general public. Some would say that if BMG focused on promoting only a small number of “strategic” albums, Elvis’ sales of those albums would put him on a par with the sales achievements of The Beatles, The Eagles etc and the resulting Diamond Awards etc could only improve his artistic credibility. What is your view on this position? EJ: I think we have about 60 albums available through normal retail, and eventually all the rest will be available through FTD. I think the question is based on a misunderstanding of the marketplace - confusing what the fan wants versus the what the general consumer wants. A romantic illusion. 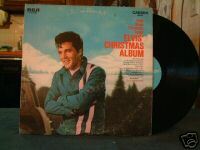 After all “Elvis Golden Records Vol 1” and “Elvis Christmas Album (the Camden Version) were Elvis’ best selling albums while he lived – not “Elvis IS Back” or “From Elvis In Memphis”. EIN: Ernst, thank you very much for taking time to talk to us today. It’s very much appreciated! Hey you all, I had a chance to read an interesting letter today from Ernst Jorgenson to a friend of mine in the music business and Ernst has little doubt in his mind that Elvis not only has sold over a billion records, but has outsold the Beatles (who would be second) by a great deal. I will try to get the letter and post it when I can, but the points I recall are as follows. For one, Elvis had a huge lead being first out of the gate and being, of course, the number one selling artist of the 1950s and an unprecedented sales phenomenon to that point at that. And even though people act as if Elvis somehow musically went away in the 1960s while making his movies, Ernst mentioned that he was still the number two selling artist in the decade at that time only behind the Beatles. He mentioned that people should get a copy of Billboard where it lists its greatest artists (through the 20th Century) and make note of the point scoring system where points are awarded to an artist for their record achievements and make note of the fact that Elvis exceeds 5000 points while the second place Beatles barely passed the 3,000 mark overall. As he mentioned, Elvis was #1 in the 50s, #2 in the 60s and #11 in the 70s while the Beatles didn't even register in the top 20 during the decade of the 70s. Ernst mentions too,that Elvis' 70s ranking in that book is also artifically low because it has not been updated with Elvis' record sales from 77 through the end of 79. He also pointed out that Elvis was well ahead of the Beatles still in 1970 and that Elvis - worldwide - sold excellently in the 70s while the Beatles had disbanded. He did mention, though, that the Beatles marketing and sales were much better in the 90s, but that Elvis already had a significant lead, never went away and has always been a steady seller worldwide with events such as the Anniversary of his death always helping to spark sales worldwide. There was also mention that Elvis has been around for fifty years now and that with so many years gone by and so many different outlets for record sales (like Time Life and various specials as seen on TV) Ie. I have never heard of it, but he mentioned an album that came with posters called Elvis From Hollywood in the 70s - sold over TV - that sold millions upon millions that is not counted and so on. Has anyone heard of this album? Apparently, it was a several record set and came with record album size photos of Elvis in Concert. This was just an example of many Ernst gave where Elvis sold millions upon million of records and they show up no where in his RIAA statistics. Oh, as to Moody Blue, he did not give a specific number but did say it would not surprise him if Moody Blue were truly Elvis' only 10 million selling album. He also said Aloha from Hawaii numbers are low too and gave other examples I do not remember.